Percutaneous endoscopic gastrostomy (PEG) tubes have revolutionized patient care. The procedure has relatively few complications and can provide an incredible benefit for patients. However, complications may arise and cause severe morbidity and sometimes mortality. We present a case of a 39 year old male who came to our institute after suffering severe head trauma from an assault. The patient required a craniectomy to treat his condition and had significant cognitive dysfunction placing at risk his nutritional status. A PEG tube was placed and the patient was steadily improving. Four weeks after the procedure the patient developed severe abdominal distension and pain. CT scan revealed the PEG tube was located in the subcutaneous tissues and a large amount of fluid in the abdomen. The patient was taken to the OR and underwent a diagnostic laparoscopy. At that time it was noted that the PEG had become dislodged and tube feeds were being placed into the peritoneal cavity. 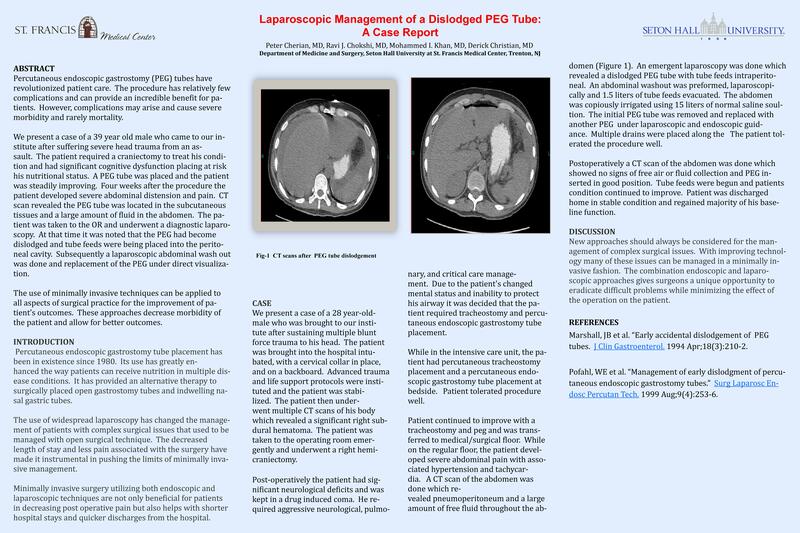 Subsequently a laparoscopic abdominal wash out was done and replacement of the PEG under direct visualization. The use of minimally invasive techniques can be applied to all aspects of surgical practice for the improvement of patient’s outcomes. These approaches decrease morbidity of the patient and allow for better outcomes.